Our grounds are located just outside Ballinlough village on the main Kells - Oldcastle road. With football beginning to thrive in the mid 1930’s and a regular kick-about taking place on the road at Gaynors Cross, the leather on the football wore quickly and money to replace it was in short supply, a more suitable surface for the kick-about was a necessity. 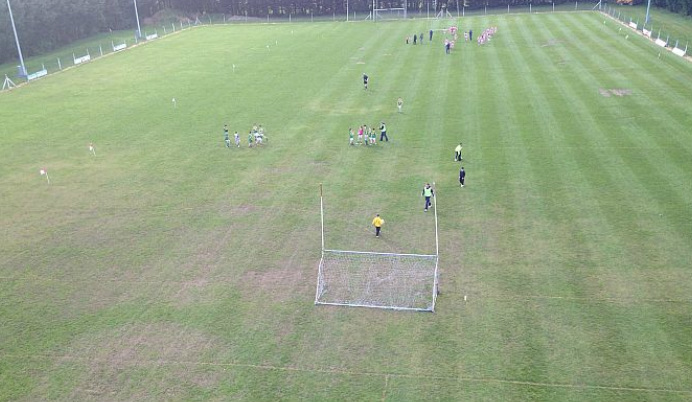 When the ball was accidentally kicked over Demense wall and into a field in Ballinlough a new venue was stumbled upon, from then onwards the field was used by the youngsters for their meetings. The years went by and the club was once again up and running, using the same field for their matches. In the late 1940’s the Rotherham Estate was taken over by the Land Commission and the club applied for a sports field on the said location. The Irish Land Commission decided that Ballinlough Football Club was worthy of consideration and in 1951 our club came into possession of a six and a half statute acre football pitch for £285 which looked a big lot of money in those days. An official opening of the Ballinlough football pitch took place in September 1976 and in the years following further development took place. In 1993 the entrance to the football pitch was completed and an official opening took place on the 1st of August 1993 when Meath played Derry in a challenge match. Further development has taken place in the intervening years, the clubhouse and dressing rooms have been refurbished and the pitch size has been increased within the last couple of years. A new floodlighting system was installed in autumn 2008 and Ballinlough football pitch now has a lighting system to compete with the very best in the county. The first match took place on the 3rd of October 2008 when Ballinlough defeated Slane in Division 3 of the A-League. Fittingly promotion to Division 2 was sealed when Ballinlough hosted Oldcastle on a dark and cold Thursday evening two weeks later.